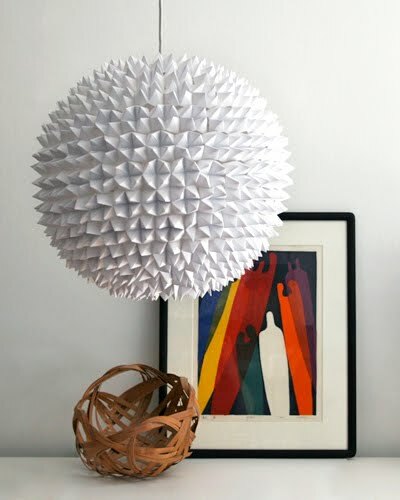 I just bought a white, spherical Fillsta light from IKEA, but if I'd had tons of extra time on my hands, maybe I'd have attempted one of these! 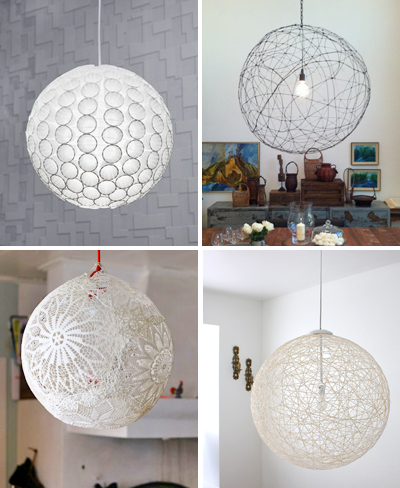 Here's a collection of round hanging beauties you can make yourself. They look like a LOT of work! An adventure in itself! These look so fun to make. I'll definitely have to dive into one of these projects when I get a permanent place! Fun for kids rooms or parties. So cute! Holy Moly. I really like these.Thanks for the links. E é claro dividir com todos vocês o pouco do que sei. Estou aguardando a sua visita, adicione e divulgue. I had to chuckle because the paper cup pendant reminded me that my parents had one made of styrofoam that the DIYed in the 70's! Thanks for bringing back the memory. I really like the IKEA one that you bought. Love the different textures and looks! This is excellent!! Don't know if I will ever do one of these but pinned it for the future in case! What is the name of the ikea light you bought? I don't see it on their website. I went with the Fillsta light. What a fun collection of tutorials! Thanks for the round up. Cute! I've seen lots of tissue-paper lantern ideas lately, and they're pretty. I do love the one you picked at IKEA. I saw it the other day and wished I owned our home and could install it. I'm dying of the lace one too. Thanks. I love the colorful piece of art that's next to the first lamp shade. Do you know who made it by any chance ? Anonymous, I don't know, but you could contact The 3 R's Blog and ask. Thank you so much for featuring my shade! I'm totally honored. I love it too and its my favorite backdrop for photographing my lights, along with the Japanese basket on the left! Allison, I'm in love with your shade. Great work! Like Brittany's parents I made a styrofoam one when I was in junior high. My parents had this killer set of craft-y Time Life books - I need to track them down. I cherished my lamp for a long time. Well, the lanterns are really great. They remind me 70's inspired design which is cool. How timely! I just decided to install a pendant light in our bedroom and I do have tons of spare time on my hands... as well as the hardware but no shade. I tried the doily lamp a few weeks ago and just couldn't get it to work. The wallpaper glue was too goopy so the doilies kept falling off. Also, the balloon shrank overnight as it got colder, so it didn't hold it's shape. Too bad because I was really excited about it. Este é o mais INTERESSANTE e CRIATIVO Blog que vi até hoje. Estou muito feliz de ter te encontrado. GRATA POR DIVIDIR. Nice pendant lights. The cups interests me. It is really beautiful. It has a dimension and makes it more beautiful. Appealing.